We haven't had much in the way of food adventures this week. Easter was a little exhausting. And then we ate on that leg of lamb for 5 days!! I'm hoping to have a little food adventure this weekend though. 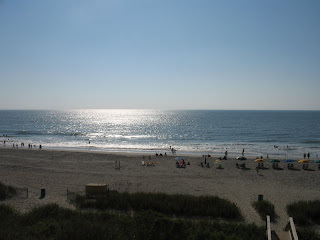 In the meantime, I've been thinking about vacation so I thought I could do a retro-post about a place we went to in Myrtle Beach, SC this past September. Its called Sea Blue. 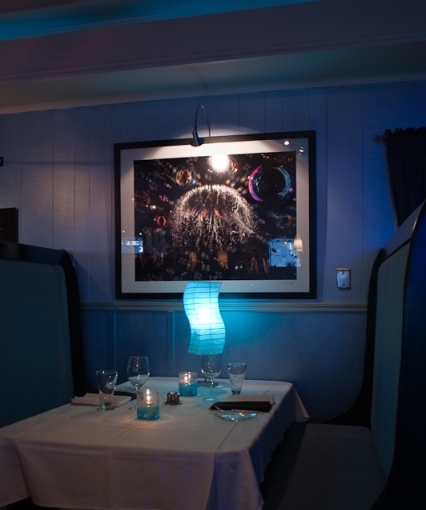 A seafood restaurant, of course, but so much more than that. First of all, its located at the end of a strip mall. Yes, a strip mall. And not even a really nice strip mall. So when we pulled up in front, we were a little suspect. Why did have to make reservations for this place?? But, as my mother always told me, never judge a book by its cover for looks can be deceiving. 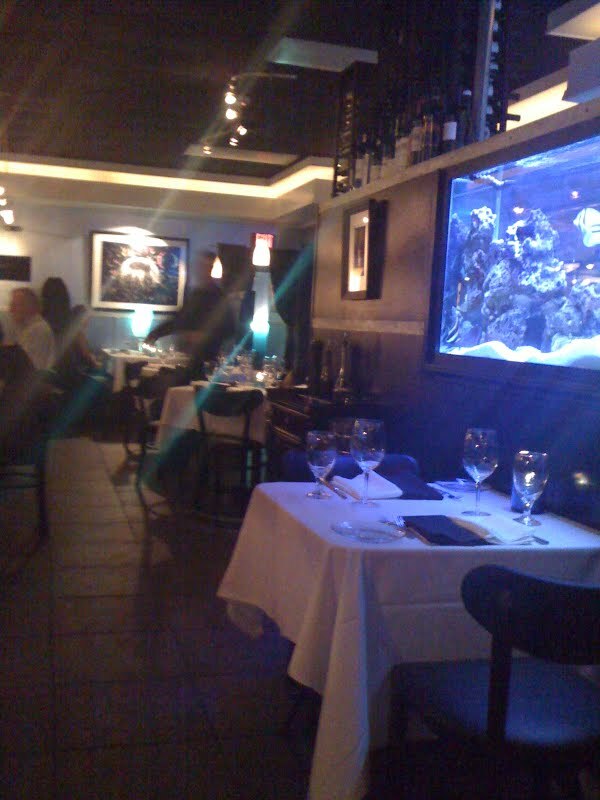 When we walked in, we were completely surprised by the elegant, intimate atmosphere. Its a small place, seating only about 15-20 tables plus the bar. 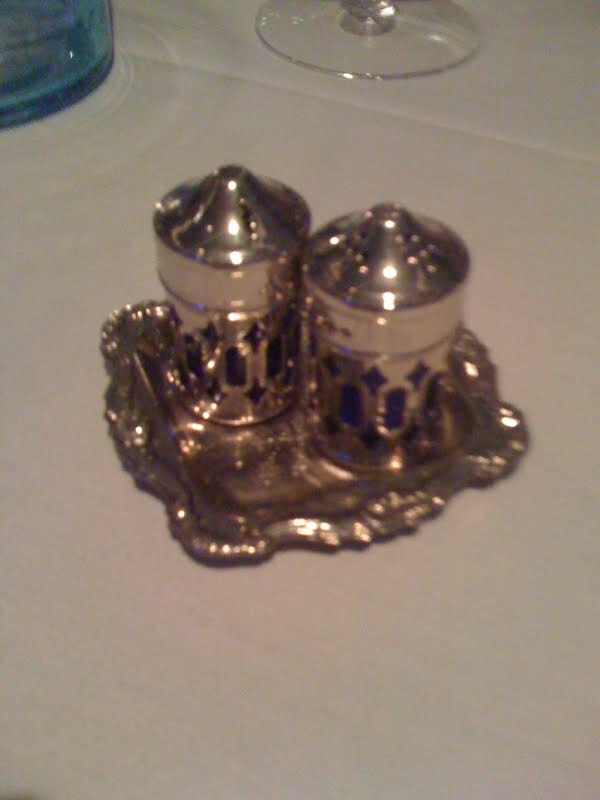 But each table was pristinely covered with white linen, soft glowing candles, and antique-looking silver and blue salt and pepper shakers. 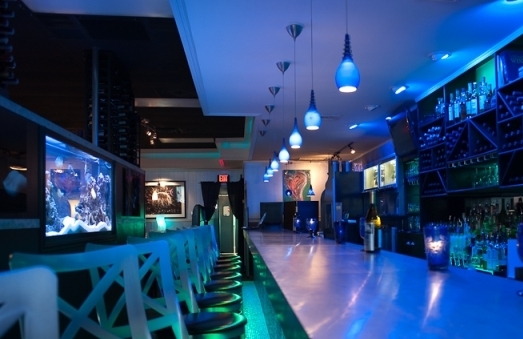 The blue neon lights at the bar gave the place a hip urban feel and separating the tables from the bar was a large tank full of beautiful colorful fish. We began our meal with an appetizer of shrimp and smoked tomato grits. Slightly sweet and savory, reminiscent of ham. For the main course, Superking ordered Wagyu Beef filet. At that time we hadn't eaten beef in about two years but if you're going to break a meat fast, this is the way to do it. Our waiter was extremely knowledgeable about the menu and even brought out some samples to show us the difference between this top quality Wagyu beef and a regular USDA prime cut of beef. The Wagyu was almost completely white with marbling (fat) which is what makes it so tender and juicy and flavorful. It was amazing. For sides, Superking also had truffle whipped potatoes and truffle mac n cheese. Both were very rich and creamy and the truffle was subtle. For my entree, I had macadamia crusted grouper fish served with lobster risotto and fresh veggies consisting of carrots, asparagus, shitake mushrooms, and green beans. The fish was very moist and the macadamia provided a nice crunch. The risotto was so savory and buttery. Even the vegges were good! For dessert, instead of our typical chocolate peanut butter cake, we ordered a cheese plate...two cheeses: morbier and triple cream served with grapes, strawberries, a blackberry sauce, and candied pecans. The morbier was fairly mild and semi-soft with a gray line in the middle. Our waiter explained that the gray line was a layer of vegetable ash which separates the morning and evening milkings of the cheese. The triple creme was so soft, it was spreadable and had a very strong flavor which paired well with the sweetness of the blackberry sauce. Once the waiter discovered what cheese-heads we were, he began telling us of a smokey blue cheese they sometimes offer. After oohing and ahhing over his description of it, he finally brought us a sample of it. So amazing! Very smokey and very blue! Not for the faint of the cheesy heart! It certainly was not a cheap meal (think 3 figures) but it was worth every penny. And it was our last meal of the vacation which made it that much more special. And whats also really neat about this place is that they strive to use local organic ingredients whenever possible, including sustainable seafood. 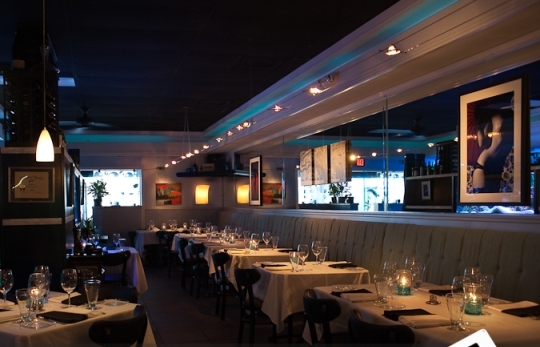 Next time you're in Myrtle Beach, you must go check out Sea Blue!! Love this place. Scott and I have been there before! Yummy! By the way...Greece? Very cool.